As always the Wessex Guy's Nurses' reunion was a great success. After the initial greeting had taken place, together with a certain level of relief at recognising faces, we all furnished ourselves with a drink and made our way to the room, kindly set aside for us by the staff of the Huntsman pub in Brockenhurst. It is always a pleasure to welcome ex-Guy's Nurses, particularly when their ages range from early fifties to middle nineties. Pat o'Riordan described her 'Wing Walk', successfully carried out for charity last year, followed this year by abseiling down the Spinnaker Tower in Portsmouth. For these two events, Pat raised circa £7,000 for the Osteoporosis Society. Not bad for someone in their eighties. Even though you might think that all topics of conversation about 'old times' would have been exhausted, we still managed to entertain each other for three uninterrupted hours, putting the nursing world to rights. When we eventually parted, we had decided next year's reunion date and entered in our diaries. Next year's Wessex Reunion will be held at the Huntsman pub, Brockenhurst. on Wednesday September 18th 2019. This year’s reunion was held at what was the Rose and Crown and is now the Huntsman in Brockenhurst. This has been the venue for the last couple of years and appears to suit most people. The gathering for 2017 was rather depleted, due to a serious fire on the Isle of Wight Ferry, that thankfully did not directly involve those who travel from that area, but meant that the ferry crossings were severely disrupted. In addition there was unforeseen sickness that interfered with the transportation of certain members and finally a couple of autumnal viruses. However, in true Guy’s nursing tradition the eleven of us who did make it had a very good time and there was no diminishing of catch-up chat over lunch. Our next reunion will be held in the same place in Brockenhurst in the New Forest. The date is Wednesday September 12th 2018 from 12 midday. I hope that as many as possible of you, who are able, will come along. The Huntsman is very convenient for trains on the Waterloo to Weymouth/Bournemouth line and is situated 3 minutes from the station. There is ample parking space and Brockenhurst is midway between Lyndhurst and Lymington on the A337. If you have any queries, please ring me at home on 02380282363 or on my mobile 07763345633. All being well I hope to see you there. 23 of us met at the Assembly House in Norwich and had a lovely time. It was interesting hearing reminiscences of Guy’s across the generations with people having trained from the 1940s to the 1980s, and we are hoping to collate people’s stories into a booklet. It was agreed that everybody would like to return to the same venue next year, the date to be announced later this year. All are welcome to join us. 23 of us (plus Robin's carer) met in Oxford at the end of March. Our training years ranged from 1940 to the 1970s. These annual reunions are great fun and we all have similar stories to tell regardless of when we trained. We would very much like to meet more younger Guy's nurses living in or around Oxford and the Thames Valley. See contact details on the reunion page - we plan to meet in the Spring each year, so do join us. 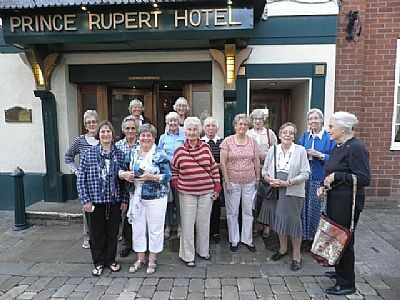 This year’s reunion was held at the newly refurbished Huntsman Hotel in Brockenhurst, previously called the Rose and Crown. The staff had reserved a room away from the rest of the bar and provided very efficient waitress service. Seventeen of us attended including some who trained in the 1940s right up to the 1990s. The wide coverage of experience always makes for interesting conversation, each group keen to hear stories from another era. As usual it was a completely informal occasion. Some husbands came with their wives and then went off to enjoy themselves elsewhere. We were all responsible for our own refreshment and the hotel provided a good menu with a wide selection of food and drinks. The weather was kind to us and allowed us to enjoy the gardens. If you live within travelling distance of Brockenhurst, either by train or car, do come and join us next year on Wednesday13 Sept 2017. The Huntsman is approximately 100 yards from the station and has ample parking space. We meet at 12 midday and leave when we have exhausted our chat. 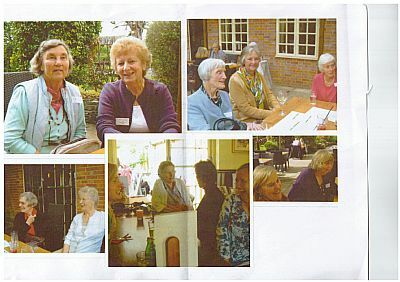 Jane Philpot (Wise), Ruth Warner (Shepherd), Gill Moore, Rosemary Landon (Banks) Penny Keevil (Jeacock), Vron Taylor, Alex Williams (Burgess), Betsy Morley (Mullineaux), Marion White, Judy Wilkins (Bennett), Dorothy Alderson (Carter), Pat O’Riordan,Betty Bussell (Alexander), Nicola Knight (Pantin), Barbara Watson,Jean Tuddenham (Richards), Marian Hubble (Read). Marian Hubble and Betsy Morley look forward to seeing you there. On Wednesday September 16th the Wessex Group of Guy’s Nurses met at the Rose and Crown in Brockenhurst. Thirteen of us attended which was slightly down on last year, due probably to the appalling weather. However the rain and squalls did nothing to dampen the enjoyment of what was a completely informal occasion. We were all responsible for our own refreshment and the hotel provided a good selection of food and drinks from the bar. If you live within travelling distance of Brockenhurst, either by train or car, do come and join us next year. The reunion next year, on Wednesday September 14th will be held at the Rose and Crown, which is approximately 100 yards from the station and has ample parking space. We meet at 12 midday and leave when we have exhausted our chat. The July 1955 set recently celebrated their 60th anniversary since beginning our training at Holmesdale. 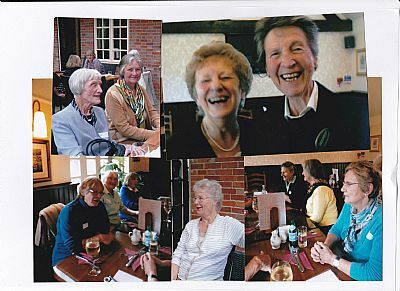 14 of us met together in Shrewsbury for a wonderful 2 day get-together arranged by Mary Drinan,nee Gilbert. We stayed in the Prince Rupert hotel well placed in the centre of the city and where were made very welcome, taking over the bar area and displaying photos and Guy’s memorabilia.! On Tuesday evening we were entertained by Mary’s granddaughter who is training at Kings College, London University and is currently “doing her placement” at Guys. She had made a little video and showed us around well-remembered- and- new buildings and explained some of her training and experiences and answered our many questions in a very professional manner. 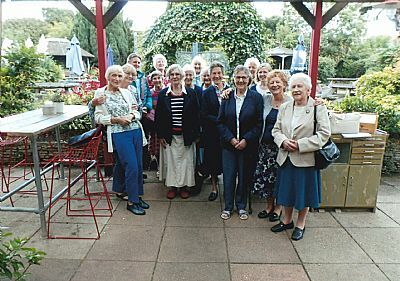 The next day, Mary had arranged a Minibus to take us to Powys castle where we had a delicious lunch in a private room. We then dispersed around the beautiful grounds in glorious sunshine,(specially ordered for the day!) and finished with a wonderfully decorated cake made by Enid Woodward, nee Wilson. The day ended with more chat in the bar and us all signing cards to send to several members who had been unable to attend due to illness or other commitments. We had come from all corners of the country and one even came from Zambia! What a wonderful feeling of “family” which we still feel towards our Alma Mater, Guys Hospital, fostered by the Nurses League. On 17th February 2015 17 of us met for lunch at the Cellar House pub, at Eaton, near Norwich. Margaret Evans-Jones and I had travelled up from Suffolk and one lady who came with her sister was from Nottingham but everyone else lived in Norfolk. There were 3 ladies who had trained in the 1940s; Peggy Steib, Ruth Barrett and Pamela Miller and one man, Philip Clarke who held senior posts at Guy’s. Thanks to Jane Ross and Joan Hellewell who organised the occasion and also to Anne Huggett and Liz Gaymer who have taken on the task of arranging next years. This year’s reunion was held at the Rose and Crown in Brockenhurst in the New Forest on Wednesday September 24th 2014. This change of venue from the Cowherd in Southampton, where we had met previously, followed suggestions from some of those present at the time, that a change of venue might be appreciated by people travelling from the Dorset area. 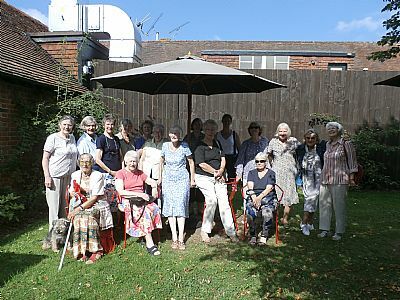 The Rose and Crown proved to be very popular and sixteen Guy’s Nurses past and present with ages ranging between the twenties and the eighties enjoyed a warm welcome, good food and a beautiful day of sunshine, not to mention 3 – 4 hours solid chat! The consensus of opinion at the end of the afternoon was that the Rose and Crown provided an excellent venue for the Wessex Reunion and that we should repeat the experience next year. Consequently, I have booked the room for Wednesday September 16th 2015 from 12 midday. If you have any queries, please ring me at home on 02380282363 or on my mobile 07763345633.